As I showed you last Friday, we headed to IKEA on our way home from Chicago a few weekends ago. What did I need? Oh, nothing. Everything. Maybe just a hit of that hallmark prefab-meets-cinnamon-roll scent. Before we left our family’s house, though, my brother-in-law went out to get the mail. When he came back in, he said, “It’s like they knew you were coming!” And then he handed me this. Because of the timing, I didn’t get to carefully plot my visit through the store with the catalog. But I sure did sit down later, with a free twenty minutes (luxurious! ), and slowly flip through it. 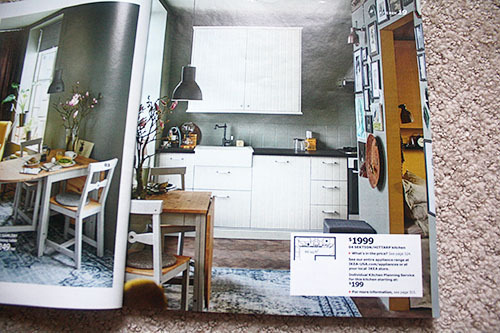 And I gotta say, I might need to edit my whole “I could live in a Ballard Designs catalog” to say “I could live in an IKEA catalog”. 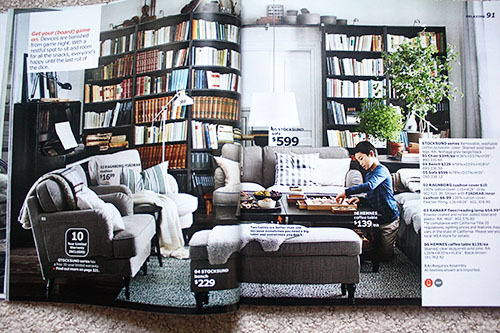 We joke about our homes as twenty-somethings (or even thirty-somethings) looking like an IKEA catalog, but that’s not giving the catalog enough credit. 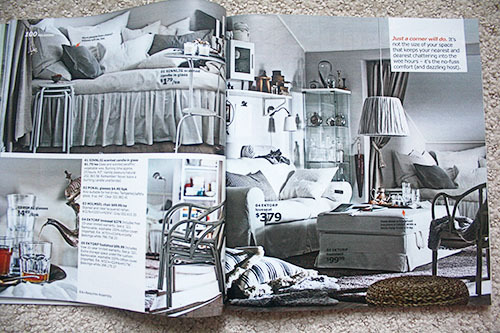 I wish my house looked like an IKEA catalog, because this year’s is ON POINT. It’s all in the styling! And they have such fun parties! So since it’s been a dang long time (two years?!) 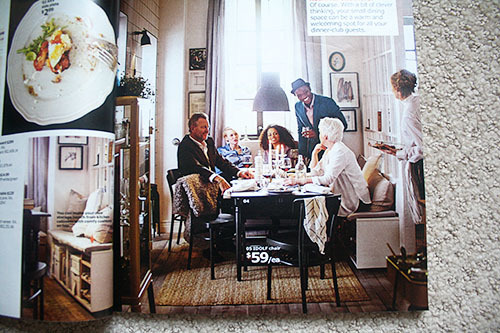 since I virtually flipped through a catalog with you, let’s hit some of the highlights from this year’s IKEA offering, ok? Some of my favorite rooms in this year’s catalog were the ones in modern farmhouse style. People think of sleek white rectangles when they think “IKEA kitchen”, but IKEA does beadboard and farmhouse sinks, too! 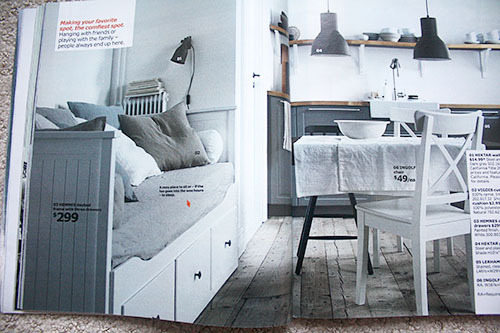 I totally want a daybed in my eat-in kitchen now. New-house goal! 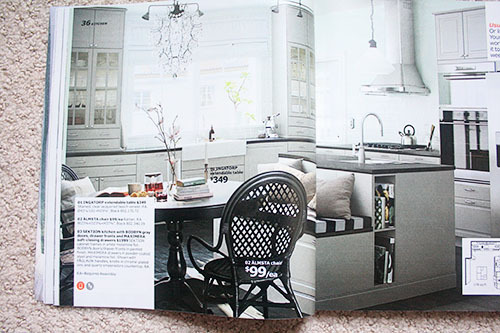 Even in a more modern kitchen, a shapely pedestal table and black wicker chairs warm and soften the space. Like farmhouse-meets-Parisian-bistro. And it’s not surprising that the black wicker was in my favorite entryway style, too. Hmmm. Black wicker chairs in my future?! Filing that away. You might notice a trend in my favorite photos: NEUTRALS. 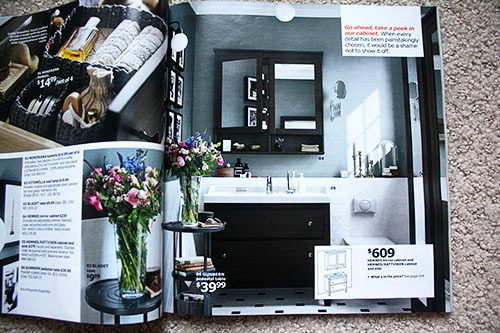 Of course, there’s plenty of color in the 2015 catalog – turquoise bathroom, pink bedrooms, green living rooms. But I’ve only got eyes for the neutrals! Those striped floor pillows, heart! 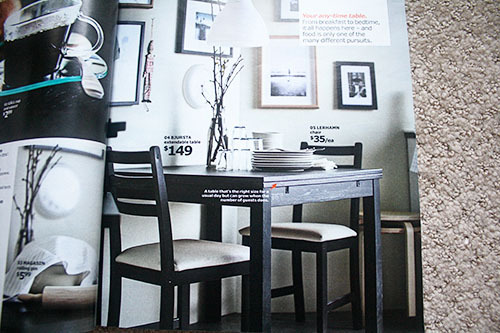 And there’s that black wicker chair again, haha. 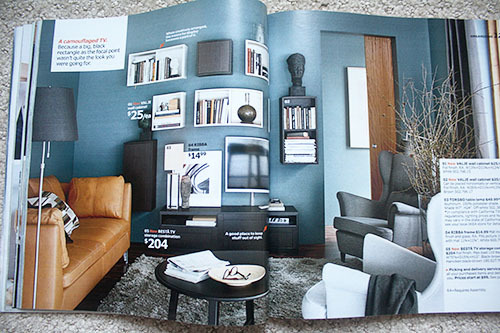 Another thing the IKEA catalog does well: gallery walls. I’ve got one cooking here (and I’m not happy with it just yet), so I’ve got my eye out for tips anywhere I can get them. That last photo looks like Baby P’s future bedroom. Sorry, kid! Hope you love beadboard and plaid as much as your mom! And speaking of Baby P, one thing I did pick up on our IKEA trip was toys. Christmas shopping, check! 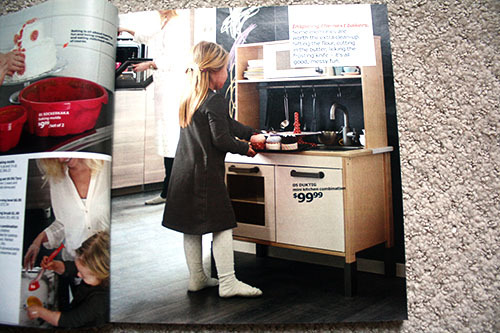 And I’m already planning for years to come, because I’m pretty sure Baby P I need this tiny kitchen. There were dozens other items that I dog-earred as “someday” purchases. Some unrealistically big, but others reasonably small. 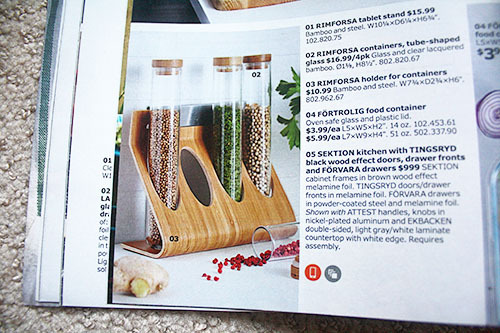 Like test tube spice bottles! Heck yes. 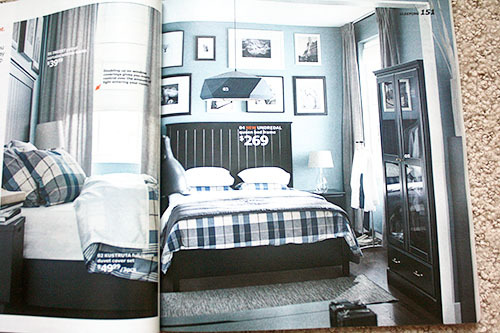 So many ways the IKEA catalog won me over this year. These photos just don’t capture all the details. 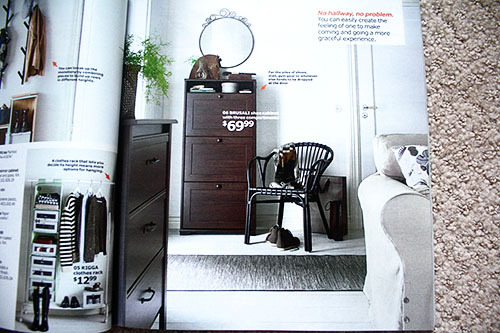 If you’re an IKEA lover as well, you really need to get your own catalog to delve into. Say, you know that scene in the Stieg Larsson trilogy when Lisbeth buys a new empty apartment and goes to IKEA and buys every single thing for her house with it? I am suddenly so jealous of Lisbeth Salander. 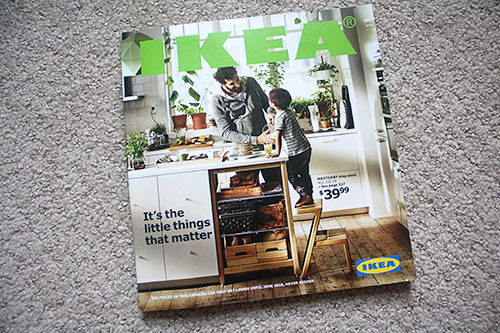 This year’s catalog actually makes me want to cast off my belongings and just start over with an all-IKEA home.